(Lowell, MA) Bringing a comic book to life on stage can be extremely difficult, but deconstructing the comic book genre onstage can bring a new round of pitfalls. While the Merrimack Repertory Theatre production of “The Villains’ Supper Club” sometimes stumbles through the scattershot superhero world created by Lila Rose Kaplan’s script, it does so with a winsome and improvisational spirit. This, combined with the fact that Rose Kaplan has packed the script with some really great comical lines, leaves theatergoers with a visually stunning and utterly unique theatrical experience that may not always make sense, but is always entertaining. In this play, we are presented with several perspectives of a world in which all but one superhero has been wiped out by a comet sent by an evildoer. As an overdramatic male voice narrates, we watch that hero, Galactic Girl (Kristen Mengelkoch), deftly dispatch a team of evil villains, all while wearing thigh-high heels and swishing her hair like she’s in a L’oreal commercial. But soon, Rose Kaplan’s script has us questioning these well-worn comic book tropes, as we learn that Galactic Girl is just back from maternity leave and is struggling to pump breastmilk and coordinate a sick child visit for her infant son. Just as the audience settles in for what is assumed to be a straight-up “girl power” take on superheroes, the play’s narrator switches midstream and the action is told through the lens of a matter-of-fact female German pediatrician, and each character (including the first narrator) eventually must grapple with the weight of expectations of the gender constructs they have chosen. If this sounds like a recipe for a pedantic lecture, it’s not. In fact, it is a rip-roaring, roller-skating, phone-booth-hopping 90 minutes on stage. 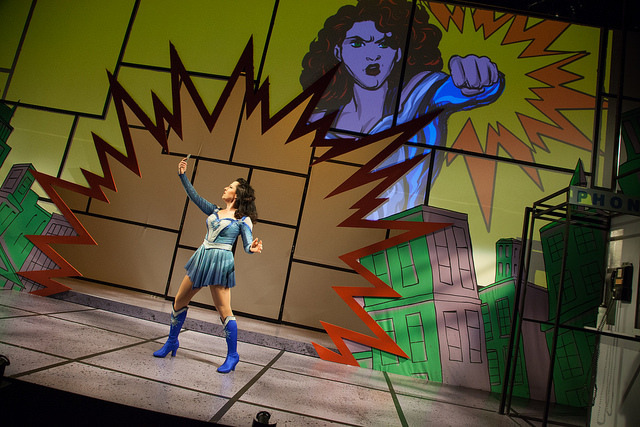 The production is defined by Apollo Mark Weaver’s sublime set design and Brian J. Lilienthal’s equally impressive lighting, which create a multimedia backdrop that combines the best elements of comic book art and pop art. These elements blend with the slow-mo fight sequences deftly staged by Angie Jepson to help us buy into this pulp world while still providing us space to critique it. There are things that don’t work in this performance. The supervillains never seem to have anywhere to put their dinnerware for their aforementioned supper club, and the loose threads of this script give the impression that Lila Rose Kaplan has yet to fully focus her keen wit to one subject, for example. But we as an audience are never left to dwell long on the beats that fall flat because there is just too life in this original and enchanting play. This entry was posted in Comedy and tagged 2018, Angie Jepson, Apollo Mark Weaver, Brian J. Lilienthal, Craig Idlebrook, John Gregorio, Kristen Mengelkoch, Lila Rose Kaplan, Lowell, MA, Meghan Moore, Merrimack Repertory Theatre, The Villains’ Supper Club by craigidlebrook. Bookmark the permalink.